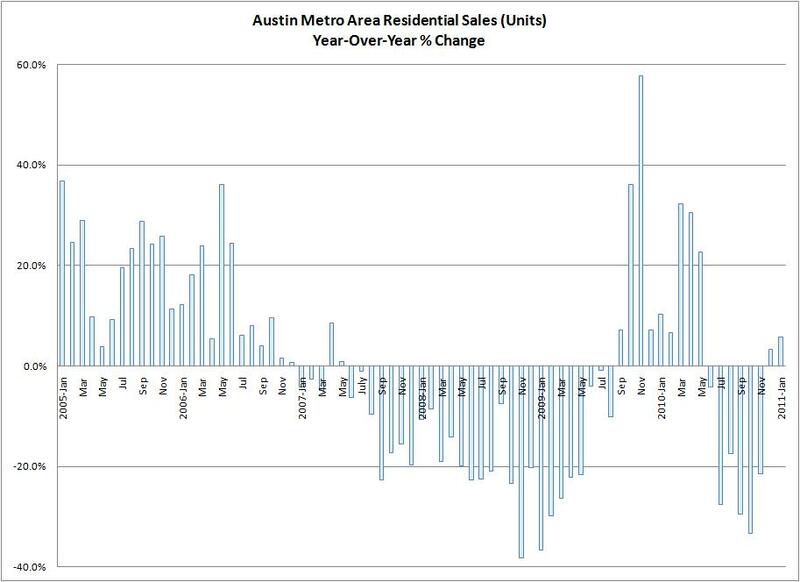 Since that data differs from my Austin Market Dashboard update yesterday, I just want to point out that the primary difference is between sales of Single Family Homes (ABoR) and All Residential Properties (my Dashboard). There is also some difference between MLS data from ABoR and the consolidation of data reported by the Real Estate Center at Texas A&M University, where I get the data for my Dashboard. Not only was this the second month of improvement over the previous year, but December 2010 and January 2011 represent the first annual improvements since May 2007 that were NOT driven by artificially stimulated demand — i.e., homebuyer tax credits. This is absolutely reason to be encouraged. As I said yesterday, though, this remains an extremely unpredictable time, and despite the many strengths of the Austin-area economy, there are national and international forces at work that we cannot influence on any meaningful scale. What we have done, and should continue to do, is to allow the business climate and entrepreneurial spirit in Austin to welcome newcomers and to help them create and find employment and make Central Texas home.